Dyeing and Screen-Printing on Textiles is a clear, easy-to-follow guide, very popular with both students and accomplished artists and designers who wish to expand their knowledge of a range of fascinating techniques. Joanna Kinnersly-Taylor covers all the key processes used in creating dyed and screen-printed fabrics using a range of synthetic dyes. This comprehensive guide includes recipes for cloth preparation, dyeing and printing, fixation, designing a repeat, and preparing imagery and screens for exposure. Advice is also given on equipment needed for setting up a studio and safe working practice. The step-by-step instructions are accompanied by inspirational illustrations from practitioners around the world. 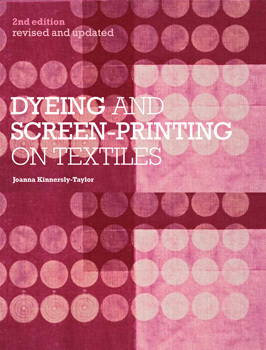 Published by A & C Black in March 2012, the second edition of Dyeing and Screen-Printing on Textiles has been fully revised and expanded. It contains many new images, charts for easy calculation of ingredient quantities, and features a refreshing new cover and layout.